Joint news conference, during which Swinney does most of the talking. Saban compliments Swinney’s Tigers. Swinney compliments Saban’s unprecedented run with the Crimson Tide. Handshake. Pose for a picture with a trophy. They have done this drill four straight seasons in the College Football Playoff. Alabama-Clemson IV, the third meeting with the national championship on the line, will be played Monday night at Levi’s Stadium in Santa Clara, California. Tide vs. Tigers might be getting old for some fans, but the latest chapter is a feature not a bug in the five-year-old playoff to Swinney. 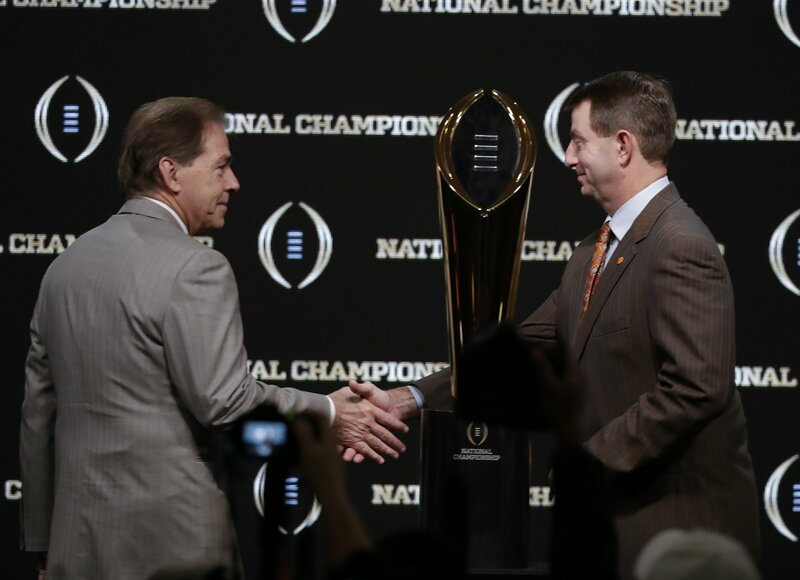 For the first time the College Football Playoff championship game features two unbeaten teams. The top-ranked Tide (14-0) or No. 2 Tigers (14-0) will become the first 15-0 FBS champion in college football’s poll era, dating back to the first AP rankings in 1936. “You’re talking about a program that I have a deep love and respect for, always have, always will, and a coach that’s — I mean, he’s won six national championships and the level of consistency is a model and an aspiration for every program,” said Swinney, who was a walk-on receiver for Alabama’s 1992 national title team coached by Gene Stallings. Saban’s accomplishments have pretty much settled the question of greatest college football coach. He might be better compared to coaches in other sports such as UCLA’s John Wooden, who won 10 NCAA men’s basketball championships; Pat Summitt, who won eight NCAA women’s basketball titles with Tennessee; Geno Auriemma, who has 11 women’s basketball championships at Connecticut; and Dan Gable, who led Iowa wrestling to 17 NCAA championships. Alabama’s dominance has been defined by almost monotonous excellence. None of Saban’s teams stand out. They are similarly stellar, machine-like in their efficiency. This team has a chance to separate from the rest. Alabama can become just the third wire-to-wire No. 1 in the AP poll, joining 1999 Florida State and 2004 Southern California. The biggest difference in this Tide team is Tua Tagovailoa, who came off the bench as a freshman to beat Georgia in last season’s championship game. For the first time, Saban has a star quarterback. Alabama has rolled through its opponents by an average of 31 points. Plenty of attention has been focused on Tagovailoa’s sprained left ankle, but Alabama linebacker Christian Miller (hamstring) is questionable. Miller has 8 ½ sacks this season. On the Clemson side, defensive tackle Dexter Lawrence will sit out a second playoff game after being suspended by the NCAA for a failed performance-enhancing drug test. Lawrence is a junior and possible first-round draft pick who has likely played his last game for the Tigers. Senior Albert Huggins will start for the second straight week for Clemson in Lawrence’s spot. Clemson’s Trevor Lawrence would be the first starting freshman quarterback since Oklahoma’s Jamelle Holieway in 1985 to lead his team to a national championship. Lawrence took over as the starter four games into the season and has thrown for 2,933 yards, 27 touchdowns and four interceptions. “If anybody ever watched him, they wouldn’t think he was a freshman,” Saban said.